Frequency allocation plans are under discussion in the US and Europe to open the lower C band for 5G applications. This portion of the spectrum provides 5G with more bandwidth than conventional lower mobile frequency bands and is contiguous while the C band is actually in use for satellite downlinks to satellite earth stations (SES). The allocation of frequencies is decided at national level. Therefore, state of the art is depicted for Germany and the US as examples. (GSA, 2019). The C band offers coverage of continental zones and is assigned to fixed satellite services (FSS). Frequency allocation for the downlink in the US is from 3.7 GHz to 4.2 GHz and in Europe from 3.4 GHz to 4.2 GHz. The C band is ideal for supporting telecommunications and broadcasting services in rural and marine areas, where a terrestrial infrastructure is sparse or does not exist. Another benefit of the C band is its low susceptibility to rain fade, which qualifies it for stable links in tropical areas. Additionally, services in the C band are essential in emergencies and in disaster recovery. However, sharing the same frequency spectrum (see Figure 1) with other parties implies interference (see Figure 2) to existing services. 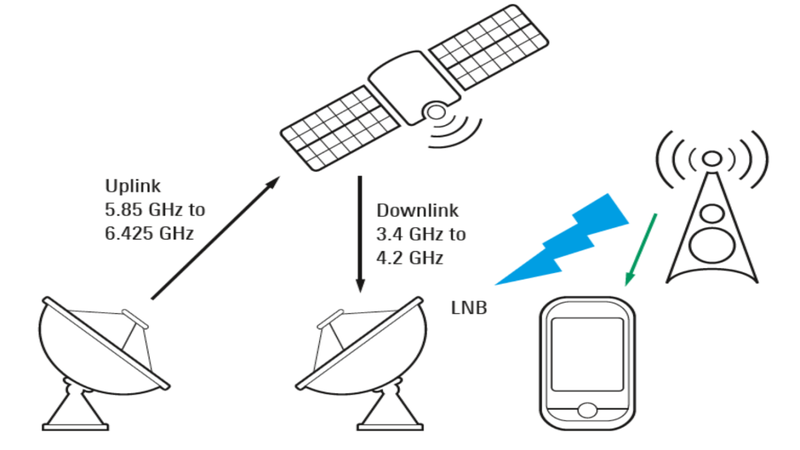 In the downlink, interference can drive the low noise blocks (LNB) into saturation. Filters cannot be applied in the existing receiving systems of fixed and mobile earth stations. The received signal, attenuated by traveling up to 36 000 km from a geostationary orbit to earth, is weak anyway and would no longer be detectable. While regulatory limits provide guidelines for planning a cellular network, they cannot ensure that waves do not radiate in a wider range than predicted. To ensure trouble-free coexistence of 5G and satellite services in the C band, interference scenarios on the component and system level must be tested in order to identify the performance limits. On the regulatory side, the equivalent isotropic radiated power (EIRP) of neighboring stations must be defined and any out-of-band emissions identified. Instead of the EIRP for legacy base stations, the transmitted radiated power (TRP) value will be used for active antenna systems such as in 5G. 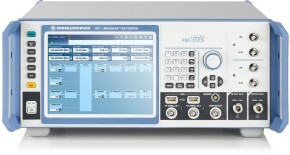 To simulate complex interference scenarios in the lab, the R&S®SMW200A vector signal generator is the ideal solution. It provides a number of predefined 5G waveforms, and further 5G New Radio waveforms can be designed. Typically, a DVB-S2 signal is used as a satellite signal and can be generated with the R&S®SMW200A. 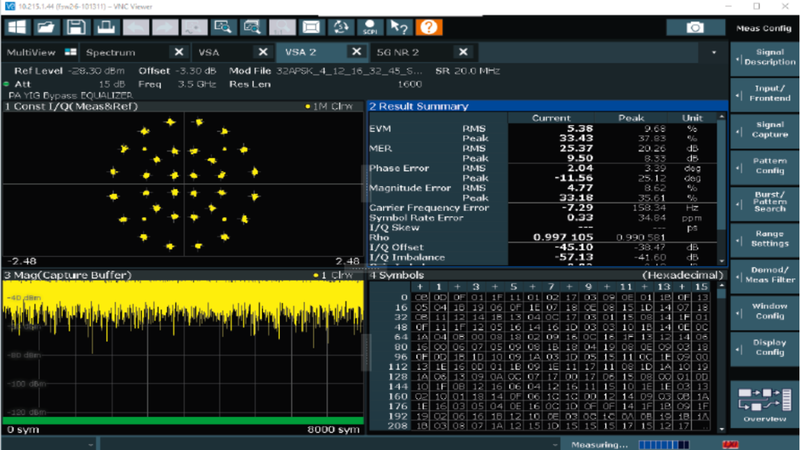 In addition to the generation of the on-board 5G and the satellite signal, the R&S®WinIQSIM2™ simulation software makes it possible to design such signals on the PC. These designed signals can then be transferred from the PC to the R&S®SMW200A as a target instrument. The two RF paths in the R&S®SMW200A make this signal generator perfect for providing the satellite signal alongside the 5G signal. This setup can be used to stimulate a DUT and simulate the influence of the 5G signal on DVB-S2 reception. The R&S®SMW200A is also the ideal choice for other satellite signal forms that can be generated using the arbitrary waveform generator functionality. Different noise types and fading can be added conveniently. The influence of the 5G signal on the DVB-S2 signal can be analyzed in various ways. If you need a specialist for generating broadcast signals in real time, use the R&S®BTC broadcast test center. Either a live MPEG-2 transport streams can be fed into this instrument from an external source, or its internal transport stream generator can be used to play out live content, which is then modulated in line with the DVB-S2 standard. This DVB-S2 signal with video or data content is decodable by modems. In addition, interferer signals can be added to the wanted DVB-S2 signal. The wanted and unwanted signals are either internally combined on the I/Q level or can be externally combined in the RF. Using both signal generators, the R&S®SMW200A and the R&S®BTC, brings two experts together: the R&S®SMW200A as the specialist for the 5G signal and the R&S®BTC as the one for providing DVB-S2 broadcast signals with live content. The R&S®FSW high-end spectrum analyzer is your choice when it comes to demodulating the 5G and satellite signals and comprehensively analyzing the impact on either signal or on both of them. The instrument features spectrum masks that can be used to measure the RF signals and ensure that these are in line with defined spectrum and out-of-band emissions. Figure 3 shows DVB-S2 and 5G signals measured with the R&S®FSW. 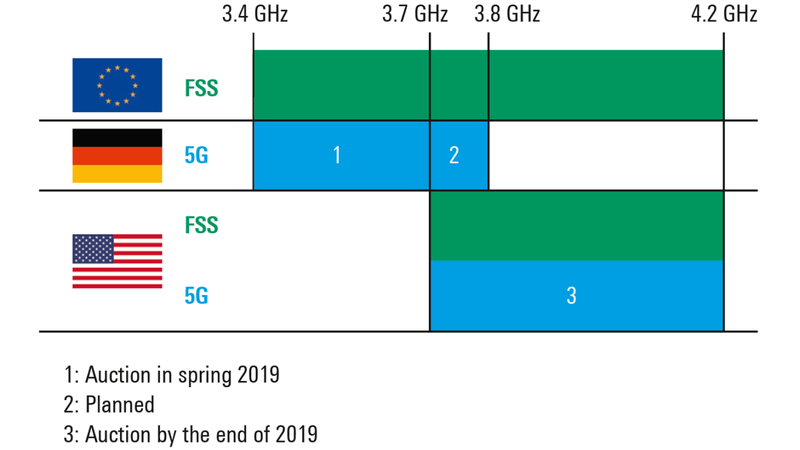 A number of frequencies are of interest for 5G above 6 GHz. 5G coexistence scenarios are expected to appear in the Ka, Q and V satellite bands. 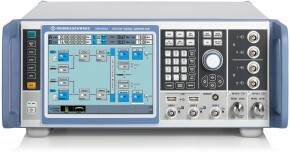 The Rohde & Schwarz instruments already support the relevant frequency bands and transmission technologies. Thanks to the range of available instruments and available technologies, the coexistence of 5G and satellite signals can be easily simulated and tested together. This saves frequency authorities, satellite network service providers and telecommunications engineers lots of time, allowing them to fully concentrate on properly testing their receiver systems, base stations and components. 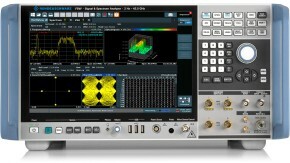 Rohde & Schwarz makes the simulation of complex coexistence scenarios quicker and simpler than ever before.